FotoWorks XL is easy photo editing software to learn how to use like an expert even if you have never experienced this sort of program before. FotoWorks XL is a comprehensive photo editing software package that allows you to alter the look of your pictures in so many ways that the creativity possibilities it affords are without limit. What's perhaps more important to novices, however, is that this simple photo editing software gives you all of the advanced options you need to make your photographs look completely professional but does so in a way that is easy to understand. You can operates all of its basic functions - such as red eye removal, cropping and image rotation, for instance – with just a few clicks of your mouse. That said, the photo editing software also affords you all of the advanced calibration functions you might need to really fine-tune your pictures in the digital realm. This means that it has a wide breadth of appeal, from beginners with digital editing to those with years of experience behind them. Among the top photo editing software systems available today, FotoWorks XL provides you with expert functions like automatic straightening to help you sort out images that you might have created from scans rather than your camera. There are various analytic tools that are available, as well. For example, you can click on the histogram functions which provides you with a handy graphical representation of your chosen image's properties. It can be used to view the hue and grayscale properties of an entire image or just a selected area within it, as preferred. There again, the histogram analytical tool will also allow you to view the mix of red, green, and blue in your pictures to help make sure that your color photos are fully balanced. Copying and pasting at a professional level is also perfectly possible using this advanced photo editing software. In fact, it is a good photo editing software package for anyone who needs to manipulate their images to remove or include certain elements. For example, wedding photographers can use the pro method copy and paste option in order to crop an image from one of their snaps and to insert it seamlessly into another. This is great for making a single composite image from several different ones, for example, taken of a group so that everyone is looking directly at the lens and is fully in focus. In addition, the photo editing software for PC users is also helpful when wedding photographers want to share their images online with a client because you can watermark everything beforehand to make sure that your finished images are not downloaded without proper payment. Click here for your free download of the Photo Editing Software! Needless to say, FotoWorks XL represents a photo editing software system which is not just for professional photographers and photo-journalists. It is a photo editing software package that can be used in schools to help budding photographers learn how to get involved with post-production techniques. Furthermore, it is a good photo editing software package for graphic designers and web developers who need to be able to tweak their images before submitting them to clients. In other words, you don't need to be an expert photographer – just someone who wants to create more vivid images – in order to get the best out of this top photo editing software. FotoWorks XL functions in many ways. You can use it to makes pictures within pictures, for example. It is also a highly versatile collage creation tool. There again, you might want to check out its print studio which is full of functionality. From here, you can make photo albums of an event or, perhaps, a memorable vacation. It will also allow you to print thumbnails in a report-style output. Equally, the system's print studio offers the chance to make posters and even calendars without any problems whatsoever. In fact, because the package is designed for Windows, you can even make use of the program's handy Outlook integration function to email your editing images to contacts and work collaboratively with them on projects. Like all top photo editing software, FotoWorks XL is designed to help you make more striking images from those you have captured with your camera. Like any easy photo editing software, FotoWorks XL allows you to pick up the skills you need to get the best out of the suite as you use it. Many people who download the photo editing software for PC usage find that they do not need to refer to the user manual at all. This is because everything with this simple photo editing software is designed to be intuitive. From the first try out, you will find that you are able to recognize the best ways to shrink or enlarge images, to zoom in and zoom out and even how to add borders without the need to read any lengthy explanations. Once the photo editing software download is complete, you don't need to be a computer expert to install FotoWorks XL either. The photo editing software immediately offers new users the chance to install it onto their computer's hard drive using a handy wizard which makes all of the decision making a breeze. On start up, the photo editing software program will offer you the chance to use a ribbon skin or a conventional one. Depending on your preference, you can make this easy photo editing software look like all of the other programs that you might run in Windows. In fact, this is photo editing software for Windows 10 machines that will also work on versions 7 and 8, if wanted. All of the options, modules and features pop up in a new window, one at a time, so FotoWorks XL always works in a way that anyone with a PC will feel instantly at home with. Indeed, because it limits the number of windows you can have open at one go, this particular photo editing software keeps you on track with whatever you are doing, one step at a time. Once you have opened the main screen, you will see that the photo editing software allows you to access any of the features from its menu, displayed on the right-hand side of the screen. However, if you prefer, then you can simply click on drop-down menus from the top of the page. For example, try clicking on the 'Effect' sub menu and dropping down to select 'Photographic Effects'. In common with other good photo editing software packages, FotoWorks XL provides you with an ensuing view of what your image currently looks like a preview of how it will appear once you apply any chosen effect. Hit on one of the buttons to see the preview image change. Some, like 'Green Light', have an outcome that is easy to predict. Others, such as 'Color Filter 2' simply have to be tried out to see what outcome they will bring about. Remember that using the 'Photographic Effects' module does not mean applying just one effect before returning to the main screen. You can keep adding effects and removing them as you see fit. All of the chosen ones and their order will appear in a list in the editing window. Like what you have chosen? If so, then you can even save your list of applied effects to use on other photos in future. Once you are happy, simply hit 'OK' to return to the main screen of the photo editing software. If not, then all is not lost because your image has yet to be processed with the chosen effect(s). Just hit 'Cancel' and try again with another editing option. It really is as simple to operate as that! In addition, it is worth mentioning that this excellent photo editor can be used to add clip art and text with ease. Both of these functions operate in a similar way. 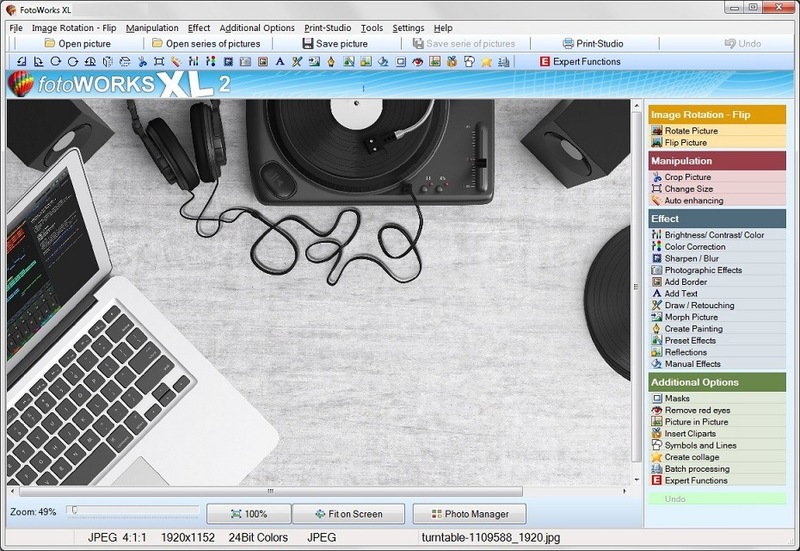 You just click on your preferred image or enter your text using your computer's keyboard and then FotoWorks XL will allow you to place it on your image wherever you like. You can stretch, skew and resize any of these visual elements using your mouse or with your fingers if you are using a PC with touchscreen technology. In the case of text, it is child's play to choose the color of your letters, the size of the wording, your preferred font, and whether you want your text centered or given a left or right alignment. What's more, text can be added with numerous effects like shading and drop shadows. Few photo editing software packages offer such as a comprehensive number of options when it comes to adding clip art and text making the system ideal for anyone who designs their own greetings cards or posters. You don't even need to use a single photograph with the system if you don't want to! 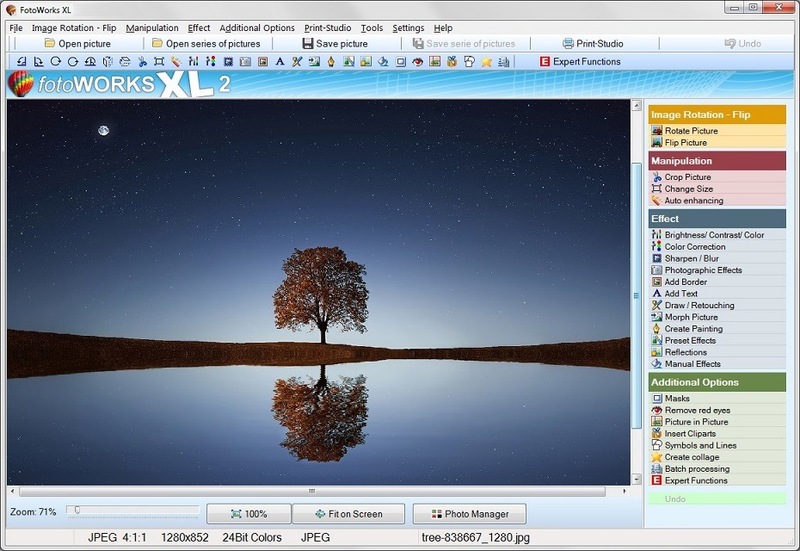 The photo editing software free download option means that you can discover what a powerful image manipulation tool FotoWorks XL is before committing to it. Thanks to the photo editing software free download capability, there is no need to fork out any money unless you are completely satisfied with the entire photo editing software package and how easy it is to use. The system's developers feel that you shouldn't be charged a single cent for it until you have had the chance to make full use of it with some of your own photos. Importing your pictures following a photo editing software download takes moments and you can get to work immediately. Alternatively, just follow some of the system designer's useful video tutorials which explain a number of the more advanced functions, such as mask effects and radial blurs, and get to work operating those. Once the photo editing software for Windows 10 is installed on your PC you can use all of its functions without any restrictions on the number of times you can use, for example, batch processing or clone stamping. This means that the photo editing software free download truly is free. The one and only restriction is that your free trial period will come to an end at some point after which you will need to pay. However, the makers are so confident that you will like what you see when you use it that you will immediately understand that this is the only photo editing software system that you will ever need. You can either use the suite to manipulate your own photographs or use the ones that it comes supplied with to try out a little creative experimentation on. Once you have tried two or three of the different options, you will soon be progressing to the expert functions and trying some of the more advanced digital editing techniques for yourself! Frequently updated and improved, there really is no need to look at anything else once you have given FotoWorks XL a tryout.